When Zach and Gray, two brothers from Wisconsin, arrive to Jurassic World, they briefly check into their hotel room. They’re VIPs, there at the behest of their aunt Claire, and her assistant gives them something important—wristbands, to signal their VIP status. Although the film never actually explores this, my mind immediately turned to Disney’s MagicBand system, a new way for offering a more personal experience at DisneyParks. Your MagicBand opens your hotel room, pays for your meals, and at some restaurants it can even inform the host that you’re the person walking up to the podium, and inform them where you’ve been seated for that particular meal. It’s unlikely that the MagicBand system was operational enough during the production of Jurassic World for it to be integrated directly into the film, but it’s a perfect technology for understanding its strategy. The MagicBand system has a complicated relationship with control: by giving the park guest a greater ease of control over their experience—fewer keys, no need to carry cash, fast pass access, etc.—it also gives Disney the data necessarily to control the park as a whole. They know how you move between rides, they know what type of people spend in what patterns, and they can design the parks in ways that support this. In the film itself, this is how Jurassic World tracks and controls its dinosaurs, but that particular comparison is a dead end. Instead, watching the film I was struck by how much it feels like the result of the filmmakers tapping into market research from people of my generation who grew up with Jurassic Park as a formative filmgoing experience. 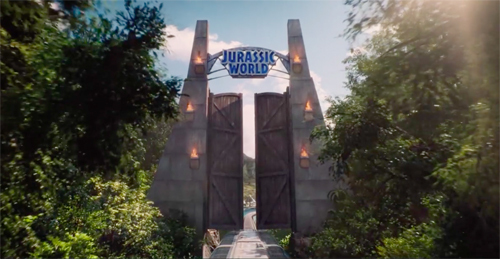 We are the “visitors” to Jurassic World, and Colin Trevorrow’s film never lets us forget it—there is no hiding the line drawn between theme park guests and moviegoers, and of the need to create “new attractions” because we’re just not satisfied with what we had before. It’s a toothless critique given that the effects-laden film in front of us fully gives into the evolution of blockbuster filmmaking, but it is nonetheless a potent one in how it works overtime to tell us not to get distracted by the shiny objects. It takes the things for which we are—purportedly—nostalgic, wraps them up in things that are shiny and new, and then systematically pushes us to wish they could just be back to normal again. And, at least for me and much of the audience I saw it with, it worked like a charm. This is not to say that I think Jurassic World is a perfect film—far from it. The film struggles to find a character to hang anything meaningful on. Claire and Owen are not bad central characters, nor is Hoskins an ineffective personification of evil, but there’s nothing about them that feels distinctive. They are reverse-engineered from the situation, characters born to serve specific ideas the film wants to explore instead of existing to test and engage with the essential idea of the film (which is how I would argue Jurassic Park’s characters manifest). The film wants to explore dinosaurs being trained, so we have a dinosaur trainer; the film is interested in the park’s balance of commercial enterprise and common sense, so we get a no-nonsense park administrator more concerned with the bottom line than anything else. The film has no interest in how they became this way, or what brought them here—we never learn why Owen chose to come to Jurassic World, or how Claire came to be working for InGen, or whether Claire’s distance from her family was a byproduct of a shift in her relationship with the family or just who the character has always been (more on Claire later). Whereas Jurassic Park brought people to the park, Jurassic World is most interested in the kind of people the park itself has generated—Zach and Gray are the only ones who truly feel like “visitors,” and it’s therefore not surprising that the main narrative of the film opens with their journey from Dane County to an island off the coast of Costa Rica. But it means the film is missing a diverse range of visitors whose perspectives on events shape the film’s themes in the way Alan Grant, Ellie Sattler, and Ian Malcolm did in the original film. The result is a film that made me feel like the visitor. There is no audience surrogate who embodies the older audience’s nostalgia, at least not with Jake Johnson’s Lowery playing such a minor role in the finished product. Instead of being organized around any of the characters, the film reframes itself as a spectacle for the audience. It doesn’t need us to relate to the characters—it just needs us to find them bemusing, limiting the burden on Chris Pratt and Bryce Dallas Howard to do more than play along and do what the ride requires of them (which they do a fine enough job with). I can’t imagine anyone going out and desperately seeking a LEGO minifig of any of these characters, for instance, but they also never feel designed to enter into the audience’s imagination. The dinosaurs, on the others hand, are meant to have sprung from it. I can imagine someone saying this in a pitch meeting—I hate this particular discursive framework for identifying something as important (I’ve ranted about place as character in the past), but it more or less works here. The film establishes a clear dichotomy between the Indominus Rex as the product of this park, and the other dinosaurs as the product of something different. In the film, this is articulated as a combination of Hammond’s original vision for the park and Owen’s respect for the animals as living creatures. If we were the type to have always wanted to dream up our own hybrid dinosaur, the film shines a light on the short-sightedness of our imagination. However, if we buy into the film’s romantic idea of what Jurassic Park should represent—shoved into an “either or” fallacy with the Indominus as though to ignore “you know, maybe we shouldn’t create dinosaurs to begin with?” as a viable alternative—the film gives us forces to root for. It gives us the raptors, and it gives us the T-Rex, and it gives us an Old vs. New battle to bring the film to a close. It’s a sharply constructed ending, especially given how the film withheld the T-Rex earlier (and how it holds for just the right amount of time on the shot revealing they’re at the edge of the tank). The T-Rex paddock is one of the stops Zach and Gray make earlier in the film, but they don’t get a great view of it—we see the goat, we see the crowd’s reaction, but we don’t get the whole show as we do with the Mosasaurus. And while the T-Rex stays “present” in the story in the visit to the old Visitor’s Center—which, even knowing it was coming, still pushed that nostalgia button hard—the film never turns into a nostalgia trip. Lowery isn’t geeking out with the kids over the comms about what they’re looking at. Gray plays with the night-vision goggles but he doesn’t put them on and see the Indominus approaching. It is not until Claire unleashes the T-Rex with the flare (which they seeded earlier for those who haven’t seen the original) that the audience’s theoretical relationship to the original film becomes full and truly part of this one. It’s the right time, and it’s deft in paying off the arc of the film—the raptors, trained to follow man but drawn to obeying the hybrid, choosing the T-Rex as their partner—while also delivering the clearest parallel to the original film. Whereas Jurassic Park III used a T-Rex as fodder to establish the Spinosaurus’ dominance, Jurassic World uses the T-Rex to give us the partnership of T-Rex and raptors we may have never knew we wanted, and yet another closing scene of the T-Rex surveying her domain. It’s not hugely surprising that the film ends its final battle with almost no interest in its human characters, or that it uses that final image of the T-Rex as a bookend after the “human” conclusion reunites the kids with their parents and has Claire and Owen walk off into the sunrise. The movie, like Isla Nublar, ultimately belongs to the dinosaurs, with the T-Rex—and Dr. Wu, who I’ll get to in a second—the only major thing keeping this from being a sequel as opposed to a reboot. It’s a good approach for an individual film, able to successfully repeat the basic patterns of the original without making those who have seen it feel like it’s a complete retread. It is what I would call a “refresh,” as opposed to a “reboot,” wherein it repeats similar story elements in ways that serve as an entry point to a younger generation without necessarily completely overwriting that original relationship fans have with Jurassic Park. In doing so, though, it recreates the same problem the original film had, which is how you generate sequels that capture the same magic. Jurassic World’s only major “reboot” is the fact it categorically ignores the two sequels, with the erasure of The Lost World particularly explicit given that no one would ever open a dinosaur park after what happened in San Diego (unless we’re being very cynical about people’s sense of wonder and amazement and spending power, with its viral marketing power overtaking the global safety concerns, which I am choosing not to). I’m not entirely against this form of retconning, but the film can’t run away from why those (relative) failures struggled to live up to the original. They struggled because the franchise struggled with how to structure a sequel without doing what Jurassic World does: build another park. Jurassic World’s producers—Trevorrow has said he does not plan to return—now has to ask themselves the same question. The park is destroyed when the film ends, and I feel pretty confident this significant tragedy while the park was actually open prohibits a sequel where they come back to do it all again. And, moreover, the films have—at least for me—cut off the path to the sequels taken by the franchise originally, as they have failed to build the kind of characters who could themselves anchor a sequel by going to an Isla Sorna-esque second location. Ian Malcolm and Alan Grant each reluctantly—and in the second case unknowingly—returning to the land of dinosaurs was how the series drew continuity, something that is still theoretically possible here but seems like it would lack the same specificity given the ineffective character work. This is perhaps why the film lays such explicit groundwork for what will serve as the fuel for a sequel, as Dr. Wu’s genetic experiments take off in a helicopter amidst the chaos. Hoskins might die during the raptor attack but the InGen threat remains, although how exactly it would manifest remains a big question mark. Would expanding the scale of the film and shifting genres to a potential large-scale military application be feasible? Is it possible to change what makes a good Jurassic Park film when this “sequel” makes the case that the best way to truly recreate the magic of the original is to more or less retell the same story? Can you truly avoid the same pitfalls as before? My experience with this film was framed by what I read about it in advance, which was more—in retrospect—than I’d have liked in some cases (like Trevorrow confirming the T-Rex was a character in the movie, which foreshadowed the conclusion pretty strongly). Most interesting, though, was Trevorrow’s recent discussion of the fact that he agreed with Joss Whedon’s “70s-era sexist” remarks regarding a brief clip from early in the film, but felt that in context the film is committed to overcoming those archetypes. It made for a compelling perspective in which to view the film’s depiction of Claire, because it’s clear Trevorrow believes that her arc undercuts the sexist archetypes she could fit into. This is perhaps best captured by having her in heels for the entire movie, with her continued survival a case of her overcoming the sexist obstacle placed on her and not any of the other characters (who are almost universally male). You can see the guideposts for this reading of the film. When Owen and Claire eventually have their romantic moment paying off the earlier “She’s too uptight, he wore board shorts to a date” patter, it’s him initiating a kiss after she saves his life; when it looks like the Indominus Rex is going to win out, she’s the one who risks her life opening the T-Rex paddock and drawing him into battle. All told, Claire is not a damsel in distress, and that is to the film’s credit. The problem is that the film surrounds these particular action beats with a lot of details that limit the character’s triumph. Just look at the moment after she saves Owen and he kisses her—immediately after, Zach and Gray still make a point about wanting to stay with Owen and not her, with her still having failed to earn their respect. And it’s hard not to read all of this in terms of Judy Greer’s unfortunately sanctimonious sister, who dismisses Claire’s rational disinterest in having children by telling her it’s “worth it,” and tacking a “learning to embrace her maternal instincts with her nephews” reading onto the heroism she shows later in the film whether or not the film intended it. I don’t know if I would argue the film is overly sexist, but it makes a variety of mistakes in telling Claire’s story—The Dissolve’s Genevieve Koski covers the heels extremely well—that reinforce the likelihood a sequel starts with Owen and Claire living in domestic bliss after the birth of their first child (which, shoot me now). The film mistakes creating moments of empowerment within archaic gender roles with actually breaking down those roles, an all-too-common mistake in modern media if not the worst possible one. It’s been a while since I went to a real, honest-to-goodness preview night screening of a movie (in this case at an IMAX 3D 7pm Thursday screening). I did it for Guardians of the Galaxy, but that ultimately surprised people, and I was at a multiplex with oodles of showings. The time before that was for The Dark Knight Rises, which was certainly a packed screening, but I didn’t have the opportunity to spend any time standing in line (since I was coming late, and had a friend saving seats). And, moreover, there was something that always felt a bit off of standing in a group of excited and cheering people to see Nolan’s dour vision for Batman, which I appreciated but was—I felt—often at odds with the blockbuster auspices the franchise took on. And I think Jurassic World does what it sets out to do on those accounts. It aims for the combination of a new generation who want to see a modern blockbuster featuring dinosaurs and the old generation who wants to see their version of dinosaurs win out over another, and the film’s strongest points are those that successfully feed both based on the data they’ve collected. This does not result in a fully cohesive film, or something that is capable of matching the awe of the original, but the refresh worked on me—I came to engage the film on the level it wanted me to, with Trevorrow asking me to join in the fight against the Indominus Rex and the people who created it by weaponizing my nostalgia and willing the T-Rex and raptors to victory. Supporting the refresh argument: the reclaimed wood from the original Jurassic Park gate used in the creation of the new one above. It’s interesting to parse out what exactly the legacy of the tragic events of the first film is here—it’s “in poor taste” for Lowery to wear the t-shirt, but they left the Visitor’s Center abandoned instead of razing it to the ground, so I’m officially interested in a prequel comic. To be fair, I can understand why the gentleman behind me was confused: Giacchino’s score leans heavily on Williams’ central themes in key moments, introducing only one “main” theme of his own to go with it. I love that theme (it starts “As The Jurassic World Turns,” which then transitions to Williams themes), and felt Giacchino’s work was solid overall, but it—like the movie—knows what you came to hear. As we’re talking gender, it’s frankly a bit odd that Zach’s character shading outside of jaded teenager is about the way he hits on other girls despite having a girlfriend back home. I liked Gray calling him out on it, but it’s just a really weird distillation of teenage boyhood for a film that ultimately has no interest in breaking down contemporary masculinity (compared to the brother/divorce stuff, which is the endgame there), and it gives Nick Robinson nothing to work with in the early parts of the film. I really expected my crowd in Madison to react more directly to the fact the film starts here, but then I realized I had been tipped off to the Dane County Airport reference, and it’s subtle enough that many likely missed it. It was a stark contrast to seeing the Green Bay Packers sequence in Pitch Perfect 2 play out in a Wisconsin multiplex. While the film gives into the romantic element of Owen and Claire’s story, I did appreciate the subversion with Lowery and Vivian (Lauren Lapkus) in the midst of the chaos—I mean, I feel like it comes from a longer cut of the (fairly lean) film where we had a better sense of the work dynamic in the control room, but I sort of think it worked as a throwaway dismissal of genre tropes. I wonder how many younger viewers unfamiliar with the series will think that the one scene very prominently using animatronics—Owen comforting the dying dinosaur—seems “fake” compared to the others. It’s a nice scene, albeit one that lacks any clear thread to what’s happening around it, one of a number of “pit stops” in the chase-focused film to try to balance the pacing. I wouldn’t say that the film makes particularly spectacular use of 3D, but the film has enough wide shots benefitting from depth that I found it engaging in the format. I expect I’ll see it again in 2D and feel like I’m getting more or less the same experience, but it works fine. It’s a bit weird the only meaningful civilian death we see is Claire’s assistant, Zara, who dies because she was too busy with her social life to keep track of the kids, I guess? That question of how terrible a person has to be before you’re excited to watch them die a horrible death in a disaster movie is an interesting one—San Andreas worked really hard to make its named character deaths into awful human beings, but Zara just ends up being an inattentive millennial, and I don’t know if that’s worthy of being eaten by a Mosasaurus. That having been said, I still love the impact her falling in the tank has, and the way the various Pteradon attacks delay the inevitable. It’s a highly effective sequence, if you’ve decided it’s cool if she bites it.